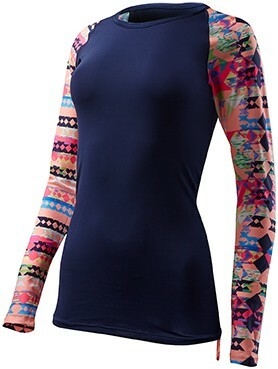 Designed for a dynamic lifestyle, the TYR Women's Belize Long Sleeve Rashguard- Boca Chica caters to adventurists both in and out of the water. Whether it's a morning workout or a paddleboarding excursion, the fitted SWLBC7AHH features the ultimate blend of comfort and function. Full length sleeves provide extended arm coverage as you move, while UPF 50+ technology ensures sun safety during outdoor activity. Fits snugly enough for me daily swim workouts. I usually wear a M in most shirts but I bought a XL based on size chart and I didn't want it ducking to my body. It fits perfect. I love the design and it's very flattering. I can't wait to wear it on the boat! 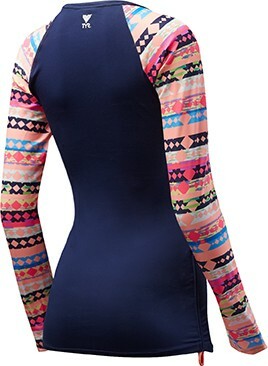 Rash guard is comfortable, the print sleeves with the navy center is very flattering. The material feels a little cheap and thin, although it does dry quickly. I am 5'8, 155 lbs and I ordered a L. A little big but very comfortable.